If you have missing teeth, then fixed dental implants are often the best solution. Dental Implants are the most natural replacement for your own teeth and will provide an excellent solution if you have lost, or are about to lose any of your teeth. Traditional dentures can often be loose and may not provide the function of your natural teeth. With Fixed dental Implants you will be able to bite, chew, speak and laugh as you did with your natural teeth. A dental implant is a titanium tooth ‘root’, which is inserted into the jaw bone. A ceramic crown is then fitted into the internal screw of the implant.This not only results in the appearance of a natural tooth, but will also help preserve the underlying bone structure, reducing further bone loss and maintaining the health of neighbouring teeth. Compared to alternative treatments, dental implants not only look natural, but function like your own teeth. In addition, dental implants are ‘stand alone’ and do not damage the neighbouring teeth. If you have no teeth, or all of your remaining teeth need to be removed, then Dental Implants are often the best solution. 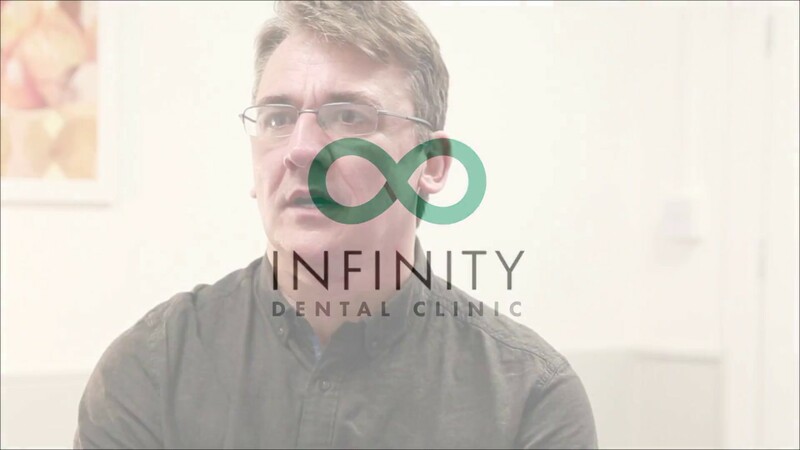 At Infinity Dental Clinic, we understand that losing all of your teeth can be a traumatic experience and we will ensure that your treatment journey is as stress‐free as possible. It is possible to replace your teeth with a full mouth of fixed dental implants, or an implant retained denture. We can use Dental Implants to replace one or several adjacent missing teeth. Larger gaps created by two, three or more missing teeth do not necessarily need an Implant per tooth. We can fit three or four teeth on a bridge supported by two Dental Implants. The exact number of Dental Implants required will depend on the results of your consultation with our Implant surgeon. Read our blog on how we can replace 2 teeth with 1 dental implant by clicking this link. Most adults in good general health will be suitable for Dental Implant treatment. We understand that all cases are different, so if you have any questions please contact our treatment coordinator for a complimentary consultation. Your Implant consultation will include a thorough medical history, clinical examination, photographs and x-rays. Models of your teeth may also be required to assess your suitability. We may also take a digital CT scan of your mouth for anatomical assessment. From the assessment, the implant surgeon will calculate the optimum size and position of your Dental Implant. If the underlying bone is deficient, a simple bone regeneration procedure will be required. What is a Bone Regeneration Procedure? In most cases this is a simple addition to the implant placement, adding bone graft material to ‘bulk out’ the underlying bone. We use leading bioactive bone graft materials which improve your bone quality and density, allowing for better ‘anchorage’ of your dental implant. At Infinity Dental Clinic we understand that your time is valuable. Dental implant treatment on average will take 3 months to complete. No one wants to spend time with a ‘gap’, therefore, we are able to provide tooth replacement solutions from day one. Gum Shaping Around Dental Implants. The gum (soft tissues) around the implant needs to be carefully manipulated to provide a similar contour to that seen on the adjacent central incisor in this example. Rather than simply accepting a compromised result, we provide our patients with a prototype implant restoration which is made out of PMMA. This looks and feels almost as good as the final tooth which is great for patients as it means they are able to have a replacement tooth very early on in their overall treatment process. In this picture, composite has been added over 3 appointments to slowly develop a similar gum contour to the adjacent tooth. The ‘before’ image shows how the tooth appeared more square and shorter in the absence of gum shaping. Therefore, regardless of how good the ceramic work is, the tooth would never look symmetrical if it was left like this. The final outcome in these cases shows as a gum contour which is very close to the natural adjacent tooth. This is the true test of a replacement tooth – to look exactly like it’s neighbouring natural tooth. 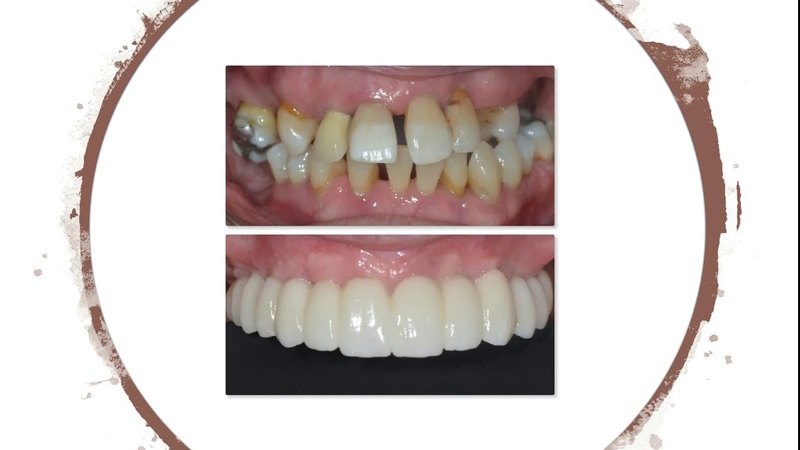 For more detailed information on how we perform the art of gum shaping at our clinic, please have a look at our detailed blog on this topic by clicking this text. Stages of Dental Implant treatment? 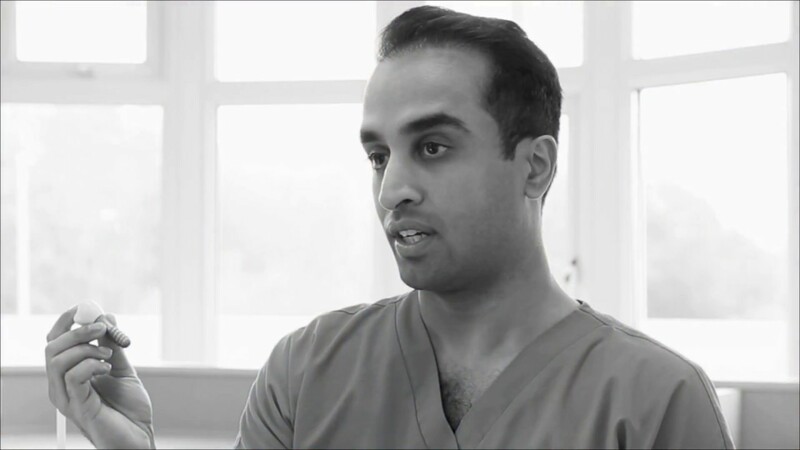 CONSULTATION: Following your consultation with our implant surgeons, Dr Patel and Dr Wilson, you will be provided with a detailed report, which includes the treatment plan and the cost of the procedure. A CBCT Scan will be provided at the consultation phase using our in-house facilities. MANUFACTURE OF BESPOKE SURGICAL STENT: Impressions of your mouth may be taken and used to make a bespoke surgical ‘guide’. This may be required to ensure that each individual implant is carefully placed in the optimum position. IMPLANT PLACEMENT: This is a minor oral surgery procedure, performed under the same Local Anaesthesia used in routine dental treatments. We can alternatively provide the treatment using sedation. The titanium implant is placed into the jaw bone replicating the tooth root. If bone regeneration was planned at the consultation stage then this is usually done at the same time as the Dental Implant placement. The area is then closed and the implant is allowed to integrate. If required, you will leave with a replacement temporary tooth where the Dental Implant has been placed. IMPLANT INTEGRATION: Dental Implants can take between 6 weeks and 3 months to integrate or ‘bond’ with the underlying bone. You should expect to feel little or no pain during this period. IMPLANT RESTORATION: Once the Dental Implant has integrated, it is ready to have the crown fitted. We are one of only a few dental practices in the UK to provide the latest Digital Dental techniques enabling us to perform Dentistry with optimum precision. Our in house CBCT Scanner and Digital Scanners allows us to provide the highest standards in Dentistry at our clinic. We work with experienced dental technicians, who specialise in making natural looking teeth for Dental Implants. The new implant supported teeth will be made to look blend in naturally with the rest of your teeth. The ‘tooth’ is simply screwed into the Implant. This is a simple process, usually requiring no anaesthesia. Dental Implants will look and feel very much like a natural tooth. You should clean them in the same way as you clean your teeth, our hygienist will demonstrate this to you. Regular dental check-ups are important to ensure that we can keep your teeth and implants healthy. Well maintained Dental Implants can be expected to last for many years and possibly for your lifetime. 97% are still there after 20 years. A Dental Implant will provide you with a tooth that not only looks natural, but will also feel and bite like a ‘real’ tooth. The Dental Implant procedure will not damage or ‘sacrifice’ your neighbouring teeth and will help to support your face to avoid the sunken appearance that can sometimes be seen in denture wearers.